Me on-top of the middle summit of Mt. Nebo. North summit in the background. Sadly, one of my major 2012 goals, the “Zironman”, didn’t happen this year due to my injured (Buzz) and recently ill (Ryan) partners. While I was a tiny bit bummed, it only lasted about 2 minutes because I have a very LONG list of adventures I was happy to fill the allocated weekends with. On June 9th, I strung together a pretty great 3-peak day : Lone Peak (via Jacob’s Ladder), Nebo (via Willow Creek), and Timpanogos (via the Everest Ridge). What a spectacular day! So, when the following weekend rolled around I headed back out for more of the incredible southern Wasatch mountains. 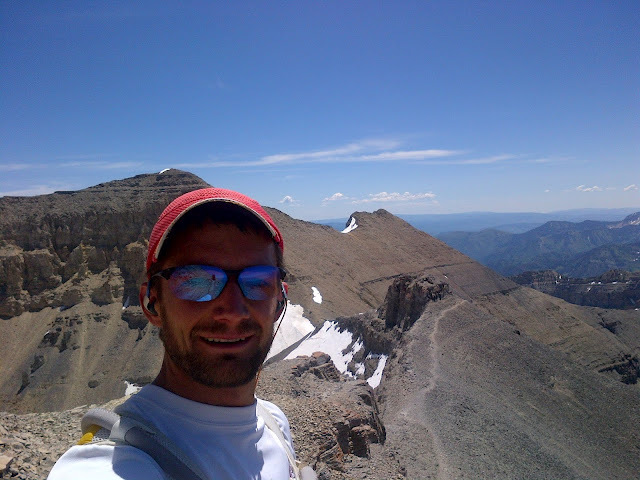 June 16th (Saturday) started off with a solo running of the Timp Traverse, starting on a random route I came up with to quickly gain the northern-most summit of Timpanogos. 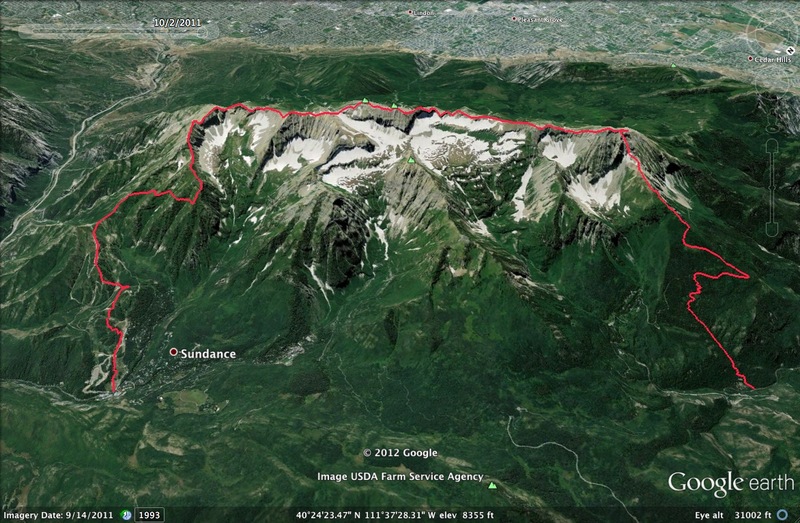 I approached it from the Bear Canyon trail in American Fork up to the Timpooneke Road, which I followed for less than a mile, then left, climbing steeply up to an obvious but tight gully. This steep adventure route got fairly gnarly in the high snow/ice gully and quickly became a shooting gallery of choss from the eroding limestone above. I finally topped out, thankfully unharmed, and took off to the south. The views are simply spectacular and unlike anythign else in the Wasatch. The east side of Timp always reminds me of Glacier National Park. The rest of the ridge was awesome with endless boulder hopping and climbing up and down steep but small peaks. I followed it all the way down to the Sundance Ski resort where Ryan McDermott was kindly waiting for me. We jumped in the truck, bound for Mount Nebo. I have recently found a strong draw to Mt. Nebo. 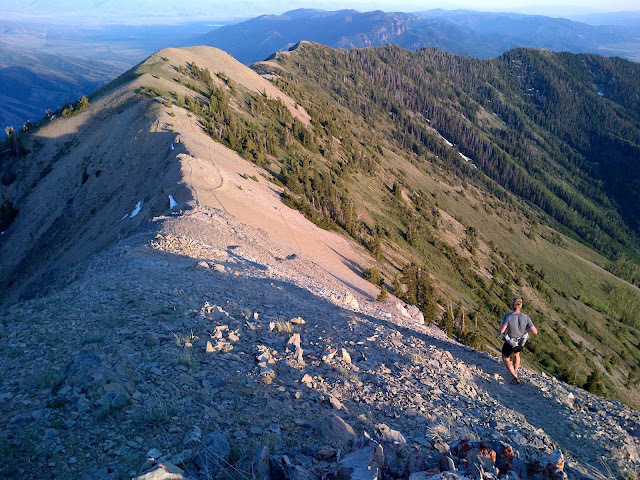 This spectacular peak is the highest peak in both Utah County and the Wasatch Mountain Range. Strangely it is rarely visited and most folks skirt by its western slopes, while driving I-15, without realizing what a gem is looming above them. Well, it is certainly worth getting to know better and there are a number of stellar routes up it, all climbing around 6,000′ to the nearly 12,000′ summit. Having recently done the Willow Creek route (south-west aspect), I was very excited to head up something called Andrew’s Ridge on the south-eastern aspect of the peak. It’s funny how drawn I can become to a route by simply exploring it on Google Earth…. I knew it was going to be good. Ryan charges out of the parking lot at a solid pace and we marched all the way to the ridge. The route up was amazing, crossing several small streams and snowfields. Despite the lack of vegetation once on the ridge I find it extremely beautiful. We cruised up to the south summit, over to the middle, and then turned back. The descent is heavenly and you can just fly. About half way down the peak, I rounded a corner and stopped dead in my tracks staring eye-to-eye with the largest black bear I had seen. I turned around and backtracked up the trail until Ryan caught up. With two of us, the bear lost interest and darted over a ridge and down some gnarly terrain. Wow, I love experiences like this as it means there is still a bit of “wild” in wilderness. This was a grand day! More pictures from this day here. Hey Jared – i know you’ve been liking the Sportiva Vertical K lately but if you want to get your hands on any more Fireblades in orange, some dude in Israel is selling a pile of new ones on Ebay at either “Buy It Now” for $78.00 or starting bids at $49.00. That was a spectacular shoe and the Orange color rocked! Thanks Jared! 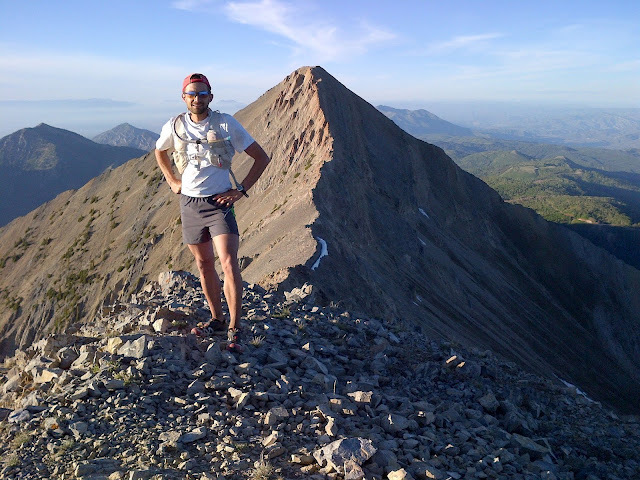 Good luck in CO.
Could that have been The Grunge Couloir you climbed to the N. Summit of Timp? Wacky, beautiful. Hi Chris. Yes, the Grunge Couloir would have been a good option, I’m not sure why I had my eye on the gully I ended up taking… more exploring I suppose. The best La Sportiva shoe for ridge terrain is probably the Raptor. It probably sound weird, but I like the Vertical K as well because it has awesome rubber, but it’s really not build for that type of terrain. The Raptor also has impressively sticky rubber. Nice work on the triple. Sorry for your sufferage on both ends of Timp. There is a cleaner but hidden line. Ask me for details. Good job! I’ve been wondering what you were going to do! See you in Silverton. The County Triple! We were planning to do just that. We really should get out for a long Wasatch day soon.